Parsley and mint are growing exceptionally well in the garden right now and the parsley was starting to get overgrown; so, I wanted to make a dish that allowed me to use it before it flowered. I find that once it gets to that stage, the flavor is very pungent and I like it a little on the milder side. 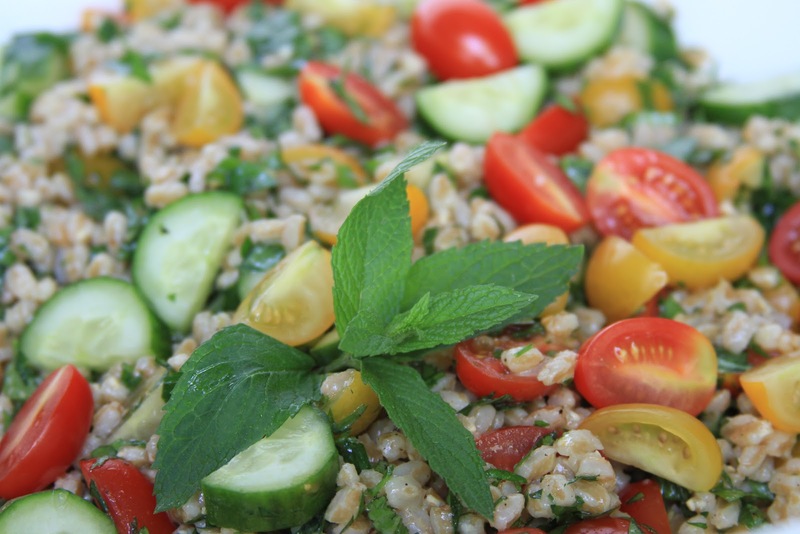 Tabbouleh is a classic Middle Eastern salad that is traditionally made with bulgur wheat, chopped parsley and mint, but I wanted to try it using farro, which I have dubbed my Favorite Whole Grain of 2013. The cooked texture of farro reminds me of barley–it’s a little chewy and nutty, and it’s great in salads or cooked into soups. I’ve even seen it made into a risotto, or, “farrotto”, more accurately. I usually cook it in chicken or vegetable stock, which gives it even more flavor. This was a very simple, healthy salad and can be made vegan by simply using vegetable stock or water to cook the grains in. Let me just say that I’m looking forward to the day (hopefully soon) that I can make this salad entirely from the tomatoes, cucumbers and herbs in my garden (I’d add lemon to that list, but let’s be realistic about that baby tree). I buy farro from the bulk section in Whole Foods Market. 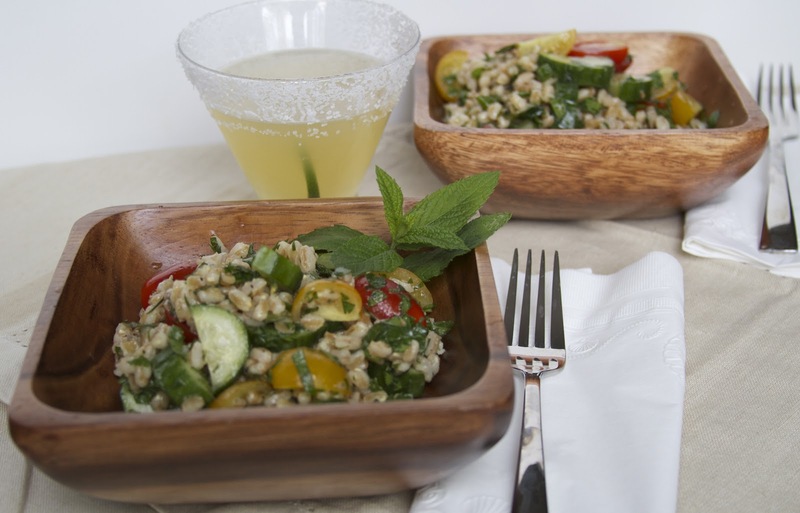 Make sure that you get “pearled” farro, as that drastically shortens the cooking and prep time. Non-pearled farro requires overnight soaking. For the tomatoes, I mixed one half pint of grape tomatoes and one half pint of round yellow “sunburst” tomatoes. My favorite, however, is a mixture of mini-heirloom tomatoes that I’ve found at Trader Joe’s. The colors are so beautiful. I chose Persian cucumbers because of the small seeds and the fact that the skins aren’t bitter and don’t need to be peeled. 1 package of your favorite small-sized tomatoes. Combine the farro with the stock and a pinch of salt in a saucepan and bring to a boil. After it comes to a boil, turn the heat down to low and cover. Simmer covered for 30 minutes. Remove from heat and allow it to rest with the lid on for 10 minutes. Next, make the dressing for the salad. Juice the two lemons into a small bowl. Add the garlic, 1/2 teaspoon of salt and pepper and whisk together. Then add the olive oil and continue whisking. Add more salt and pepper if it needs it. Now, pour half of this dressing into the cooked farro while it’s still a little warm. The farro will soak up the dressing and the seasoning very nicely while it’s warm. 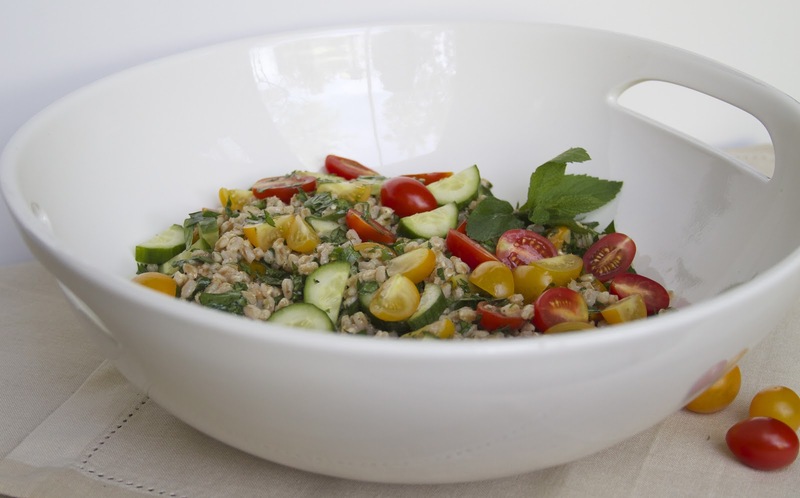 Place the farro into the refrigerator to allow it to cool. Chop the mint, the parsley and the green onion and put into a salad bowl. 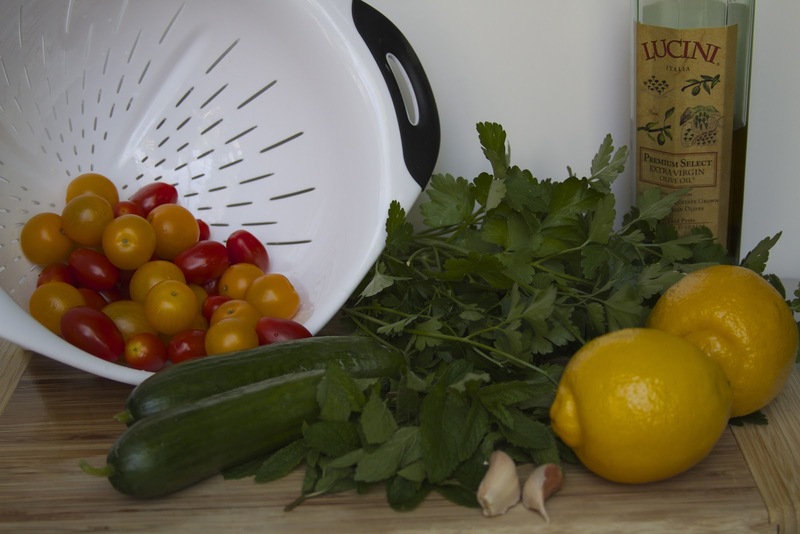 Also halve the tomatoes (or quarter them if they are a little bit large) and cut the cucumbers into small pieces and place them in the bowl with the parsley and mint. After the farro has had a chance to cool, add it to the vegetables and mix thoroughly. Then add the remainder of the dressing. The Man of the House prepared a classic (and quite stiff) Margarita to go with it! Rim a rocks or Margarita glass with kosher salt. In order to do this, “paint” the outside of the glass with a lime wedge, then apply the salt to the outside edge of the glass. Put the glass into the freezer to chill for a few minutes. 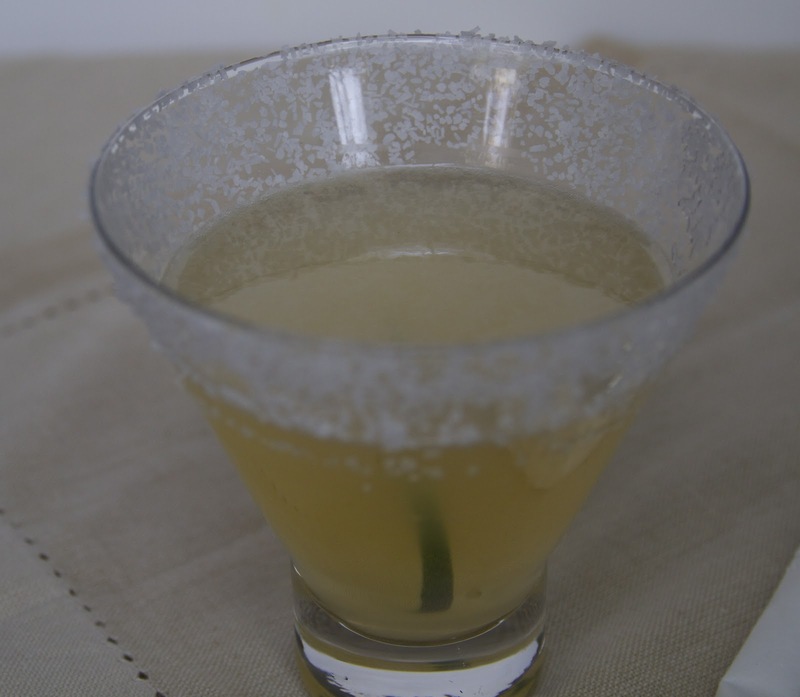 Combine Tequila, Cointreau, lime juice and agave nectar in a cocktail shaker filled with ice. Shake and then strain into the chilled glass. Enjoy!